North Dakota Soybean Council Night. $1 Cloverdale Hot Dog Night. SunMart Ticket Day! Bring in your SunMart receipt of $25 or more and get a pair of general admission tickets free on any Sunday, Monday or Tuesday. Schmidt’s Gems & Fine Jewelry Night. The first 500 kids receive a Cloverdale Kids Meal thanks to Cloverdale Meats. The first 500 fans (18+) in the stadium receive a free appetizer card from Ruby Tuesday. PBR Night! First 1,000 fans 21+ receive a PBR Can Koozie. Special two 16 oz. for $6 on Pabst Blue Ribbon all game long. College Night! $3 general admission ticket with college ID thanks to North Dakota Air National Guard. Post-game Autograph Party - After the game, fans are welcome to gather along the third base line for autographs from all RedHawks players. 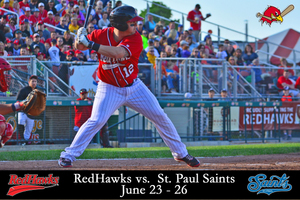 The first 1,000 fans will receive a RedHawks Lanyard courtesy of Starr Fireworks.